The technology is nothing new (it was originally developed in the 1950's), but the application for today might have been a litle more spectacular than the inventor had in mind. To get the boring stuff out of the way, jetboats work by pulling in water from below the boat and feeding it through a pump and shooting it through a nozzle in the back. This is in contrast to your usual prop engine sticking down below the boat and "screwing" its way through the water. So a jetboat has a few advantages. It works in very shallow water, it can turn on a dime, and it's crazy fun... particularly when you're flying by a rocky canyon wall so close you could touch it. Life at the speed of a jetboat. My first experience with a jetboat was aboard the Hukafalls Jet near Taupo on New Zealand's north island. Once aboard, we held on tight as the jetboat whirred and came alive, and just like that, we were off. To get things started, we headed down the river. Along the way, narrowly dodging trees sticking out of the water and skimming by the steep, rocky cliffs lining the river. Every few minutes, the driver would stick his finger up in the air and make a circular motion with it. This is when you hold on tight. A sharp turn of his wheel and we dive into a 360 spin, kicking up huge amounts of water in dramatic fashion. After doing this a few times, you're bound to get pretty soaked. Most of us smiled, while some (1) were scared for life. Some enjoyed the ride more than others. After heading up the river, we arrived at the base of Huka Falls. Here, the teal-blue waters of the Waikato River narrows from 100m across to only 15m, and comes crashing down 11m (35ft). It's a huge volume of water (200000L/sec), and in the jetboat, you can get right up close and personal with the falls. It's quite the sight. After a view of the falls, it was time to head back. Once again, we daredevil-ed our way down the river, with the occasional break in speed only to drop into a 360 spin. And with that, our 30min ride was over. Jetboating: So nice I did it twice. A month later, it was time to do it again. This time near New Zealand's (and possibly the world's) adventure capital "Queenstown." The target? Dart River Jet Safari. In contrast to the "thrill ride" that Hukafalls Jet offered, Dart River Jet Safari is a 1/2 day experience. You start with a beautiful drive from Queenstown to Glenorchy (provided by bus, or drive yourself like we did), bus transport to a short (and easy) hike in the forest in Mt Aspiring National Park , and then hopping on the jetboat for a 60min ride back to Glenorchy. Drives and short hike aside (I'm more than familiar with both), let's cut to the chase. I was here for the jetboat ride. Our ride was on the shallow, "braided" Dart River. In contrast to the steep cliffs lining the Waikato River, the Dart River spreads its waters wide over constantly shifting channels of water. A large amount of rain or glacial melt could shift the look of the river in a matter of hours, and these channels that we would be almost flying down would sometimes only be a few centimeters deep. On one occasion, or driver had to turn us around to find another braid when the channel we were navigating became too shallow to pass. While we took on the occasional 360 spin, this ride was more about the outstanding scenery of Mt Aspiring National Park (and the absurdity of going so fast over so little water). It was a little tiring being on the boat for 60 minutes with the bright sunshine and the wind blowing on your face, but the whole experience of it all was more than worth it. At $109 NZ (~$95USD) for 30 minutes, the Hukafalls Jet is more like a ride at an amusement park. It's high on thrills and chills (water), and a good way to experience a jetboat once. On the other hand, the $219 (~$185USD) Dart River Jet Safari gives you a longer jet boat ride, and a chance to see some of New Zealand's more spectacular scenery up close and personal, particularly if you're not traveling with your own car. Pick your poison. Want the best New Zealand travel advice? ALWAYS rent a car. While both provide life jackets and splash jackets, be sure to dress warm as the water splashes are fresh, and the weather in New Zealand is always unpredictable. Take care of your camera if you decide to take it, and bring a good pair of sunglasses to reduce the glare on the river. 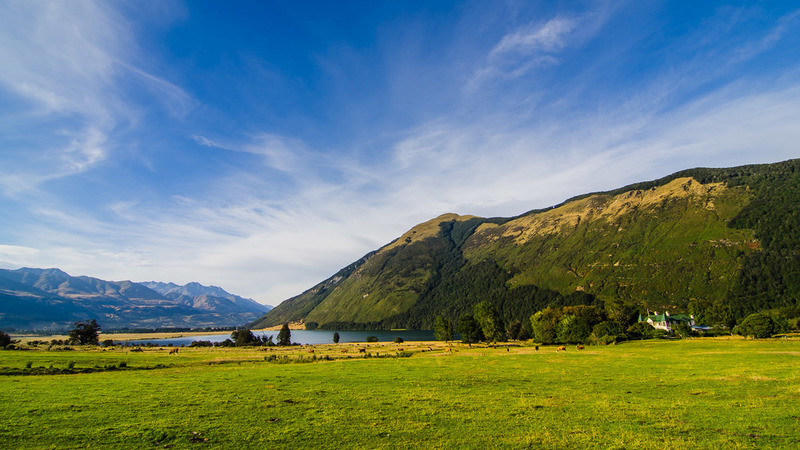 Like a lot of attractions in New Zealand, it pays to book in advance or as part of a package. Check out the websites before you go for deals. Booking a day in advance can often save you 20% on the stated price, and package deals will save you even more if you're feeling particularly adventurous / wealthy. In Taupo, I stayed at Urban Retreat. This nice hostel was nice for what it was, but larger than I like. Unfortunately, it seems to be a partner with the bus tour groups, and gets quite noisy when those people fill the place up. In Queenstown, I stayed at Haka Lodge. One of the best places to stay on a budget, Haka Lodge was made from the ground up by travelers who obviously know what they're doing. From solid bunk beds, to lockable drawers underneath... no corners were cut here. Their private rooms are also quite nice and done up well. There are a pair of shared kitchens to choose from, so it never felt too busy or overwhelming, and the internet was free and totally workable. Finally, free parking is available, and it's just far enough from downtown to be quiet and mellow, while still only being a 5-10 min walk from the action. It was easily one of my favorite places to lay my head down on our "Travel With a Local" New Zealand trip. It's also worth mentioning that I stayed at Haka Lodge in Christchurch as well. Again, the attention to detail for the needs of a traveler showed, and no bunks was a wonderful surprise. It's a little further from the city center, so I'd recommend it as a good spot if you're traveling with your own wheels. My trip to New Zealand wouldn't have been possible without the support of our "Travel With a Local" partners Tourism New Zealand, Hostelbookers, Nokia, XCOM Mobile, and the many local partnerships we had. Thanks to Haka Lodge for providing accommodation.